The Manchu's established three major administrative units and gained the support and loyalty of some nobility and the numerous monasteries. The head of Mongolia was the Emperor of the Qing Dynasty, who ruled all of Manchuria and China as well. Three Manchurian ministries were established in three major administrative cities - Hovd (Khovd), Ih Huree (present day Ulaanbaatar, also known by its Russian name, Urga) and Uliastai. These three Ministries were strategically positioned in the north, the center, and the west in order to facilitate the rule of six territorial divisions that existed as kingdoms before the Manchu subjugation. The Ministries were usually ruled by the Manchu's, but were staffed with both Mongolian and Manchu officials. The Hovd Ministry in the west ruled Dorvod and Tsetsen Khan Provinces; the Ih Huree Ministry ruled the capital and the Central and Eastern Provinces of Tusheet Khaan and Zasagt Khan; the Uliastai Ministry ruled the Midwestern provinces of Sain Noyon Khan and Khovsgol and Uriankhai districts in the North. 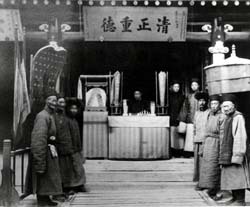 A Manchu court in Ih Huree, 1900, courtesy of the National Museum of Mongolian History. The government structure was hierarchical, and Manchu's held the highest executive posts while the Mongolian princes were given lower administrative posts.